And, although I don’t normally have a problem with “hopefully”, for once I might agree. Sentence adverbs – or, as linguists call them, “modal adjuncts” – are adverbs that, rather than modifying the verb in a sentence, express an attitude towards the sentence itself. They frequently appear at the start of the sentence, set off by a comma: “Hopefully, I’ll find them”; Honestly, you may not”; “Frankly, my dear, I don’t give a damn.” Although all such words can operate as standard adverbs* – “she looked up hopefully”; “he spoke honestly for the first time”; “his eyes gazed frankly into hers” – when placed in certain contexts they take on a higher function: one of commenting on the thought being expressed. The 1960s saw an increase in the frequency of modal-adjunct use for another adverb: hopefully. Alongside They’ll wait hopefully (“They’ll wait with hope in their hearts”), it became increasingly popular to use sentences like Hopefully they’ll wait (“It is to be hoped that they’ll wait”). This unremarkable little piece of linguistic evolution might have gone unnoticed, if the aging usage specialist Wilson Follett had not bristled. It is “un-English and eccentric” to use the word that way, he asserted dogmatically (Modern American Usage: A Guide (1966), page 170), even though (as he said) the German equivalent “hoffentlich” is fine in modal-adjunct use. Follett was dead by 1963 (his posthumous usage book was completed by Jacques Barzun and others), but he left a legacy: By the late 1960s, using hopefully as a modal adjunct was widely taken to be a grammatical sin. For a few years, battles raged and peevers fumed. But the opposition peaked when disco was young, and Barry White and the Love Unlimited Orchestra were hot. By 1979, [conservative language columnist] William Safire had accepted the modal-adjunct use of hopefully … The dispute was basically over. It was, having started and finished in less than two decades – although Associated Press, out of an abundance of caution, prohibited the usage until 2012 before finally caving in. Compare “He was flirting with her too obviously”, which comments on the manner of the flirting, and “He was obviously flirting with her”, which doesn’t. 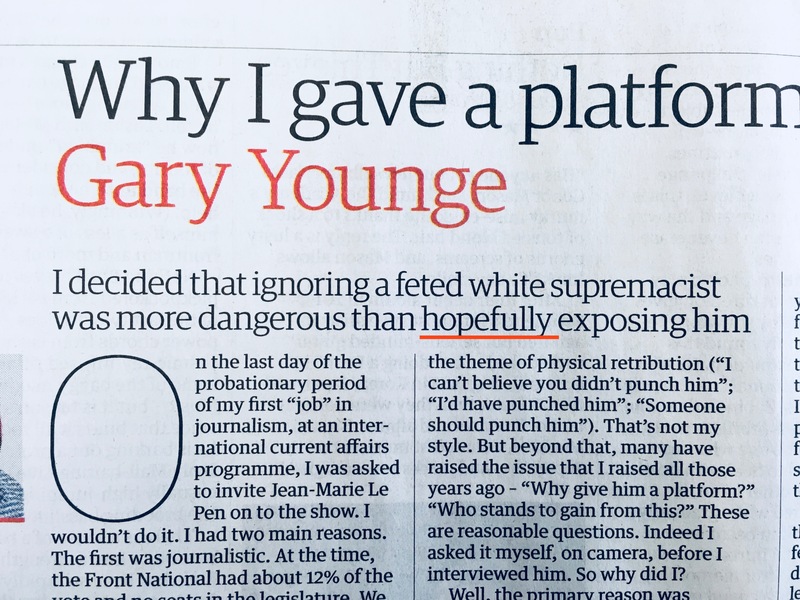 – there is nonetheless something amiss with the Gary Younge standfirst that prevents “hopefully” from functioning as intended. 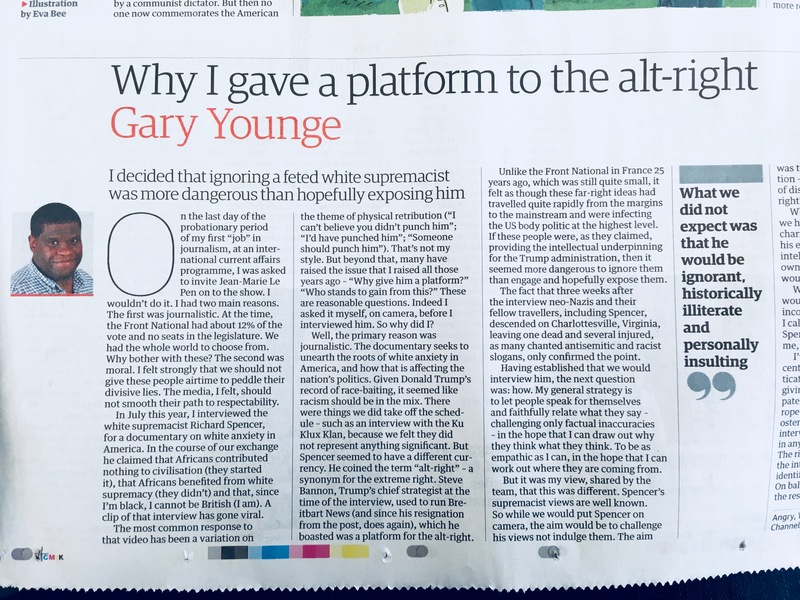 The sentence is an intricate one: the main subject and verb, “I decided”, is then followed by a long, comparative construction: “ignoring a feted white supremacist was more dangerous than hopefully exposing him”. In fact, the comparative construction functions as a complete sentence on its own; the main verb is “was”, and the subject of the sentence is “ignoring a feted white supremacist” – a verb phrase functioning as a noun, or, in other words, a gerund. The object in the more/than construction is also a gerund – “exposing him” – and it is this idea of exposure that “hopefully” is trying to comment on, rather than directly modify. But, if anything, it really only succeeds in doing the latter and creating the idea of “exposing in a hopeful manner”. It is possible to use modal adjuncts with gerundive constructions – “Hopefully, going to the coffee shop won’t make me late” – but I can’t think of an example where they succeed other than when placed at the start or the end of a simple sentence. In this standfirst, however, we have a “sentence adverb” that is neither intended to modify the verb that it sits next to, nor the sentence as a whole, but instead act as a comment on one of two gerunds contained in an independent clause. Setting it off in commas might help a bit, but, I fear, not enough. Sentence adverbs can do a lot, but I don’t think they can do that much. *Also known as “manner adjuncts”. Spotted on holiday. Probably largely preheated and nonfat. 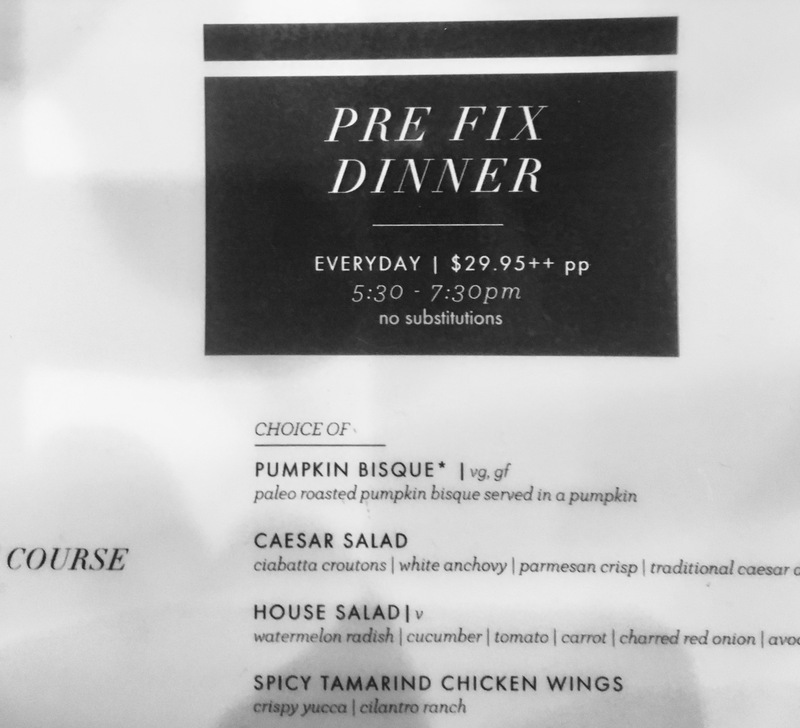 Let’s hope it isn’t parboiled, halfbaked, overdone or indigestible: if so, it’ll be left uneaten.